52 FT model. Popular for straight trucks, semi tractors, trailers and also for working on more than one rig at a time. The Duz Mor Heavy Duty Truck Machine is a technician’s dream, a true one man operation. Forget the heavy lifting, it is not a part of operating the most efficient heavy duty truck machine on the market. This is the only machine that comes standard with an overhead crane built right in. All Duz Mor H D Truck Machines are custom built to fit your needs. 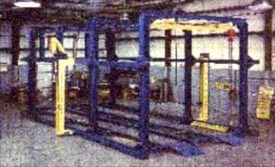 The machine dimensions range from 28ft to 60 ft in length depending on the types of repairs you’ll be performing. Working on Straight trucks and tractors? Order a 28ft model, or if you want to work on large trailers or two trucks at a time, order up to a 60ft model ( built in 8ft increments). Whichever size you order we can add on to it at a later date. Whether installed over a pit or on top of your existing floor the DUZ MOR HD Truck Machine is the most versatile machine ever built and with the option of changing the configuration at any time it will continue to meet your needs for years to come. It comes complete with from 4 to 10- 12ft towers and extensions to pull up to 14ft above the floor, not to mention a 2- ton over head crane to lift 5th wheel plate and tanks out of your way. 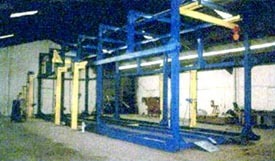 If you have a special need, you can have two overhead cranes and four 2 ton hoists. Complete with a 25-ton ram and auxiliary hydraulic out-let on each tower powered by an electric/ hydraulic pump your capabilities are unlimited. Pulls are not just 360 degrees around the vehicle but 3-dimensional. All Duz Mor products, including the HD Truck Machine, are built with you, the customer, in mind. Duz Mor was founded by a frame repair technician who believed that there is an easier way to do the work, so why not build the machine that will do it. We have continued with his philosophy by continuing to improve our products by listening to your needs, and making your work easier with innovative ideas incorporated into all of our products. Wouldn't you be better off with a Duz Mor HD Truck Machine? Please call us for details!